Orcas Island has a world-class reputation as a travel destination, but it is a distinction that comes with challenges: a seasonal service economy with many low-paying jobs, rental housing that is expensive and often available only part of the year, many off-island owners and part-time residents, and high property values that are out of reach for local wage-earners. 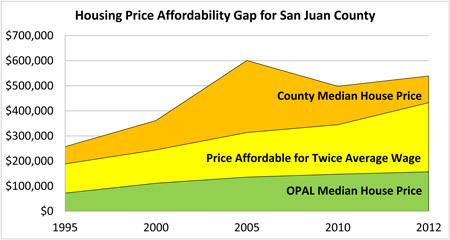 From 1970 to 2012, the average wage in San Juan County increased 392% while the average assessed value of property increased 3,117%. Housing costs have far outstripped the ability of many local wage earners to pay for them. San Juan County – with high real estate values and low wages – consistently has the highest affordability gap in Washington State. Buying a median-priced home requires a 20% down payment plus an income of more than $75,000, yet the average island worker earns $31,500 a year. A household with two adults working full time, earning the average wage, cannot afford the median-priced home. Affordable housing remains one of Orcas Island’s most basic needs. Consistently, there are more than 15 households that are qualified and waiting, or are in the process of qualifying, to purchase an OPAL house. In addition, there is ready demand for OPAL’s 29 apartments with rents affordable for households with very low incomes.